Our regular readers may recall a post from the end of June where we highlighted short term highs in the VIX Index and performance thereafter. For those not familiar, the VIX Index is calculated from CBOE volatility in S&P 500 options contracts for the two months ahead. It's underlying goal is to provide an estimate of future volatility, but for the most part we have noticed that turmoil in the present causes short term spikes in the index. 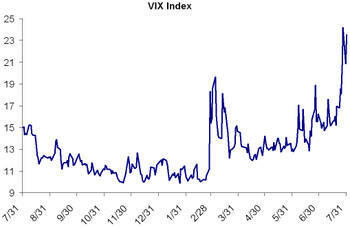 Below we highlight the VIX index over the last year, the two spikes occurred during corrections. For historical performance after these kinds of spikes refer to our previous post. Are you sure about your analysis of the market's performance after 6-month VIX highs? My analysis shows much worse performance. I can send you my spreadsheet, if you wish. NOTE: I am looking at VIX highs, not VIX peaks. Of course, we don't know about a peak until after the fact. Dear John B, thank you for link below "Cramer begging for money", does anybody doubt that SOPITALISTS went nuts? Does anybody doubt that SOPITALISTS are biggest Hypocrites in the world. When A poor single mother gets help, she is a burden on society, older men/women ask to preserve purchasing power of pension, they are lunatics. When WALL STREET asks for easy money, so that Paulsens ilk earn $50 million/year and everybody else loses via weak $Dollar, that is CAPITALISM. Now do you get it? Why I call this SOPITALISM? Has getting requiring shorting of stocks on an uptick changed the nature and relevence of the Vix as a financial indicator? The Relative VIX is quite high and that is a very reliable bottom spotter. It need not be THE bottom, but a pretty good low is at hand.